One taco tuesday I decided it was time I went to La Carnita to try their famed “In cod we trust” taco. 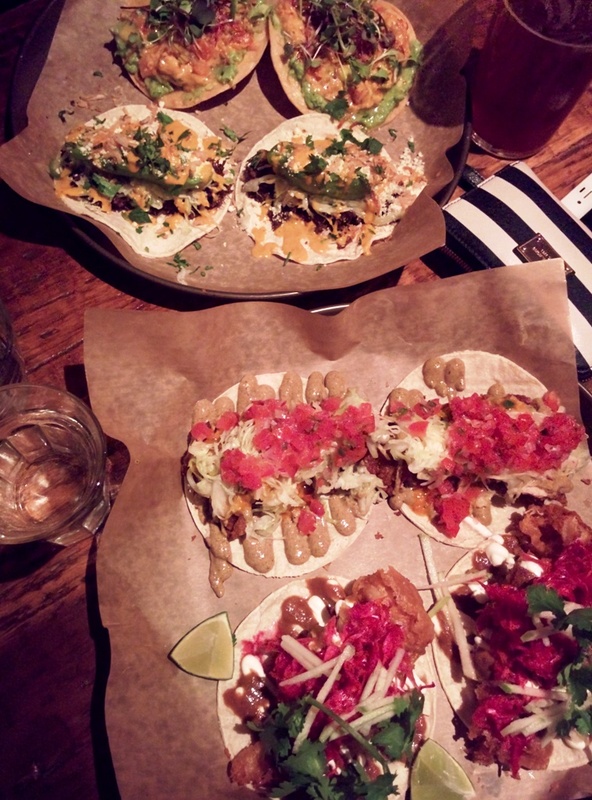 Their menu is short and sweet, a couple of apps and 6 tacos to choose from. 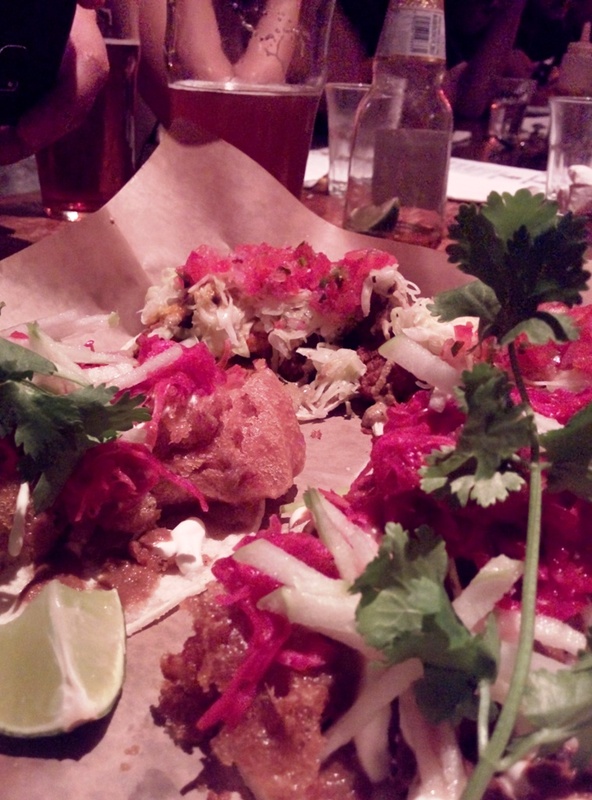 Out of the six I chose four, the chicken, the tuna ceviche tostada, the beef cheek and of course the fried cod. I was excited for what was to come and boy did it take some time, the place was packed and we waited a good 25 minutes before the food arrived. They all arrived together, colour coordinated and looking good. I separated mine for everyone’s and went for it. I started with the chicken, it read very strangely; being served with a peanut mole and it didn’t work for me, the chicken was crisp and the toppings fresh but it was like eating a satay taco, and I’m not into fusion tacos. In addition there was little to no prescience of the Rossy’s hot sauce. Second I gave the beef cheek a go, this was a good taco, everything worked and it was pleasing with a good hit of spice. I’d left the seafood ones for last, this was rather tactical as I had a feeling they would be better and I wasn’t wrong. 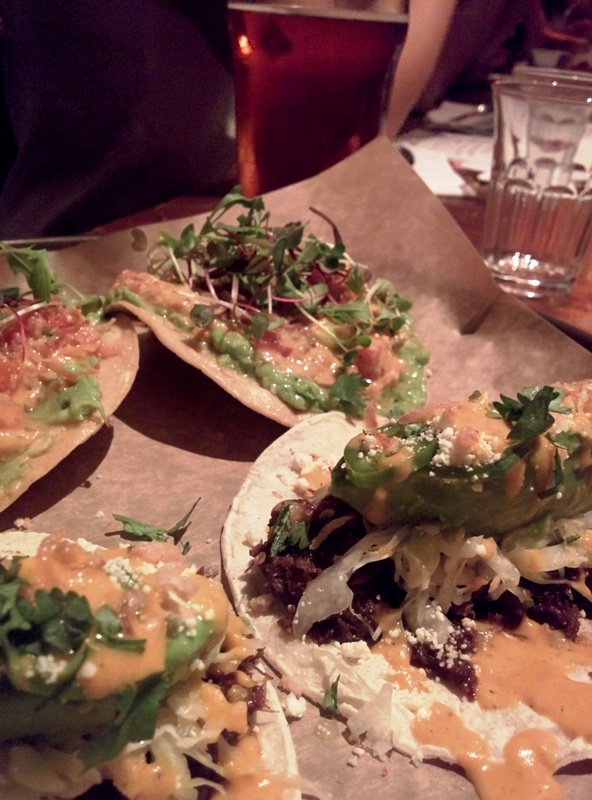 The tostada was great, a balance of creamy, spicy and crunchy with a great ceviche flavour. Lastly the most talked about, the “In cod we trust”, in terms of tacos it wasn’t my favourite for the night, the tostada was, but in terms of fish tacos it was great, crispy fried fish with the right accompaniments. I couldn’t ask for more, except maybe some hot sauce. Their rotating specials and the pork ribs on Sunday will have me going back to La Carnita soon enough. Posted on August 20, 2015 October 13, 2015 by AdrielPosted in Canada, SteakLESS, TorontoTagged ceviche, Chicken, Fish, taco, Tacos, Toronto, tuna.